Scenic Land Company President Duane Horton talks about the site of the planned Canyon Ridge Resort while unveiling the plans in May. 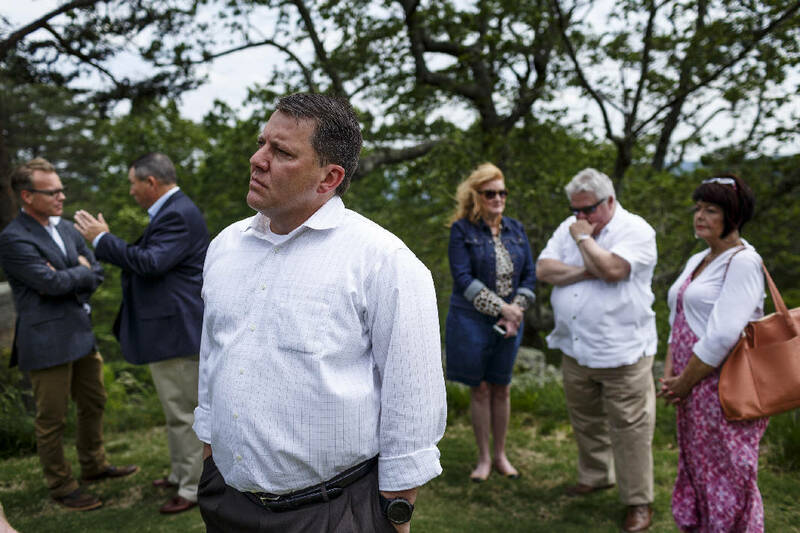 Two key elements of Walker County's agreement with the developers of Canyon Ridge Resort are missing from their legal agreement, but Commissioner Shannon Whitfield said they will fix the problem before they're too late. During public meetings last week about the project, Whitfield told residents that the county will abate property taxes on Scenic Land Company's investment for 30 years. In exchange, he said, the company will continue to pay taxes as if the investment had not happened. Right now, for example, the property is worth $16,000, much less than it will be if the company manages to develop a luxury resort. This part of the agreement allows Whitfield to argue that the county isn't losing anything in the deal. Also, Whitfield told residents, the county won't trigger the abatement unless the company reaches two goals: invest $100 million in the project, and hire 180 full-time employees. But a memorandum of understanding between the county and the company does not outline that part of the agreement. It merely says that if the company is short on its goals, it has to pay the Walker County Development Authority some money in proportion to how short they are. For example, if the resort operated with only 90 employees, the company would have to pay taxes on about half the value of the property, instead of paying on none of it. Also, the document does not mention anything about the company continuing to pay property taxes at the "pre-investment" rate, as Whitfield promised. The commissioner said both of these elements will be fixed. The memorandum of understanding allows Scenic Land Company CEO Duane Horton to tell investors that, in fact, the county is on board. But Whitfield said the document can still be cleaned up. "You're bound to miss some things," he said after a community meeting last Wednesday night. "But we have such a good, working relationship with these guys that we're all communicating. We want this to be a win-win." Horton said he hopes to receive a $106 million investment for this project in the coming months. He wants to break ground on construction by spring 2018 and open by summer 2020. When property value is added to the land, the county will abate 100 percent of taxes for the first five years and 90 percent of taxes for 25 years after that. Horton said market studies suggest Canyon Ridge could draw 35,000-50,000 visitors per year — with an average room rate of $280. Whitfield, meanwhile, believes the deal will be a boon for Walker County. He believes the resort will bring in $26.4 million in sales tax over the next 40 years. At least one element of the memorandum of understanding drew a mixed reaction: the minimum amount employees would get paid. The contract defines minimum pay as "the average wage of the county with the lowest average wage in the state." According to the Georgia Department of Labor's most recent report, that would be Glascock County, where employees make $24,500 a year. For a family of four, that's $100 shy of the federal poverty line. Dean Kelley, coordinator of the Walker County Tea Party, said those pay rates would be too low for local workers. "Most of these jobs aren't going to come from Walker County anyway," he said. "Walker County people aren't going to come up [Lookout Mountain] and clean rooms." David Boyle, chairman of the county's Democratic Committee, thinks the minimum pay rate might not matter. The company might not be able to find employees for that amount. According to the Bureau of Labor Statistics, the average hospitality workers in Georgia and Tennessee earn about 10 percent more than the lowest possible payment to Canyon Ridge employees. And during a presentation, Horton told residents that annual salaries will range from $20,000 to more than $60,000. The lower-level jobs, like bellhops, will rely on tips to boost their overall pay, he said. One potential concern, Boyle said, is that the resort might hire immigrants who would work at rates lower than what most county residents would consider reasonable. Boyle, who co-wrote a history of the Latino population in Dalton, said that could undercut most workers. He said the county should add an element to the contract mandating that the company hire a certain percentage of employees who lived in Walker County before they applied for a job. He believes this could keep pay higher. "The wage issue is serious," he said. "It's serious for social justice; it's also serious for economic development. Those kind of jobs are not the kind that the commissioner is talking about. Why are we creating these?" Matt Williamson, chairman of the Walker County Republican Party, said the clause in the contract "seems to create a floor, not a ceiling." He and Boyle both said their political parties have not taken formal stances on the resort's tax abatement. But Williamson said the deal is positive for the county. Added jobs are better than nothing, he said. Whitfield said the county didn't drive a harder bargain on employee pay because market forces will dictate how much those workers should get. "[The Canyon Ridge team realizes] they have to be above average to attract quality people to come in and work there in order to provide the high-quality service to cater to their customers," Whitfield said. "The supply and demand will drive those wages."